Look who has made it down just in time to witness all of the aftermath. Adrik, Enya, and to a lesser extent Bjorn are of the school of thought that magic should never be used around humans since humans just want to kill all the magics. Marie, on the other hand, sees humans as an incompetent threat at best and has openly flaunted her magical abilities in front of human crowds on numerous occasions. Marie has learned the subtle difference between posing as a harmless Demi Lineage and might as well flood the town while you're at it. However, where Marie can always change her face the others don't have it as easy. Wraiths and Demis are not welcome in towns and Dwarven magics are a tightly kept secret from all humans. Suffice to say, Fae still has a lot to learn about blending in. 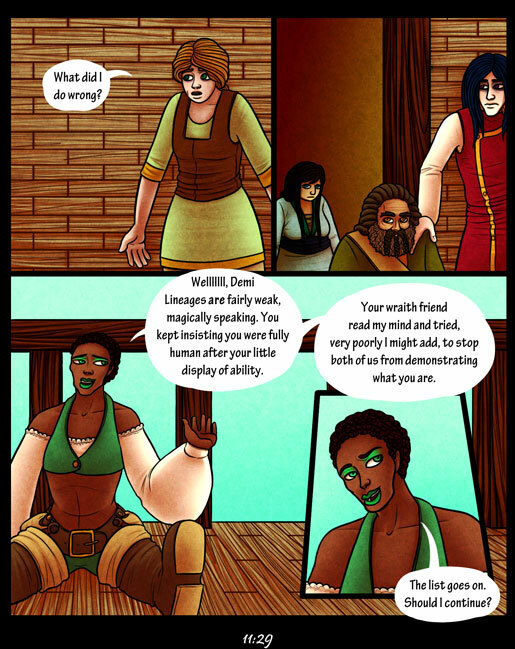 Today's vote incentive is more brand new prologue content. It's the last page of the re-done prologue.